I marked my forty-first spin around the sun on Friday and to celebrate we did a family three-day weekend in Saranac Lake, way up north in the Adirondacks. Our visit coincided with the opening of the annual Winter Carnival there and we enjoyed checking out the ice palace and the Saturday night fireworks. But the true highlight of the weekend in a weekend loaded with highlights was checking out the fluffy bundles of gray-and-white feathers, Perisoreus canadensis, the Gray Jay. In light of the fact that Gray Jays often see people as a food source and I had it on good authority that the birds at Bloomingdale Bog, not far from Saranac Lake, had gotten mighty accustomed to people feeding them, I made sure that we had some salt-free almonds to offer when we arrived on Saturday afternoon, ready to amble down a snowy trail and see what there was to see. It didn’t take long for a Gray Jay to go from not there to suddenly there, look, right on that branch! 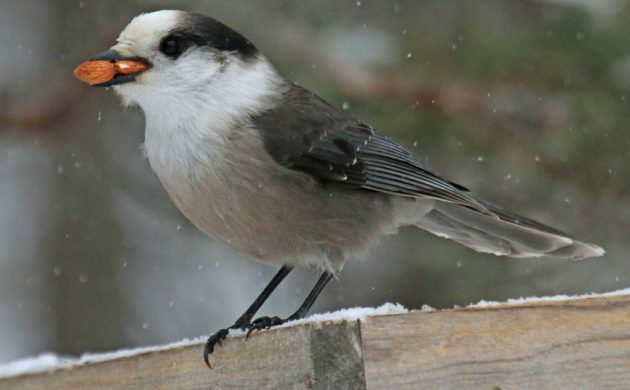 This Gray Jay is eyeing us up, evaluating the likelihood of snacks. Desi was delighted that our search was so easy, and even more delighted when he had the opportunity to put some almonds on his hand as an offering. It took some patience but, eventually, the jay came down to investigate more closely. I missed the shot of Desi’s happy face but you can hear the joy in the video below. The video was shot by Daisy and we’d like to thank the folks up the trail who realized what was going on and waited until after the jay flew off before continuing on their walk. Desi didn’t stop talking about his close encounter with the Gray Jay the entire rest of the day. 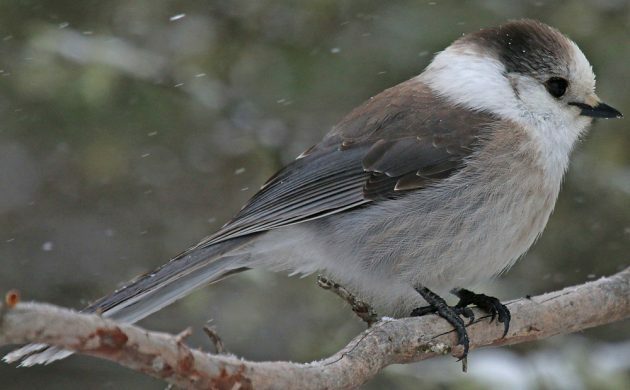 When he started up on it again in the morning we decided to go back to Bloomingdale Bog after brunch and see if we could find any more Gray Jays. This time they refused to come to hand but instead of seeing just one we spotted three. They did enjoy raiding the feeder once we left some almonds there. Two almonds at once! What a glutton! Not to be outdone, this Blue Jay went for three! Nothing much compares to up close encounters with wild creatures to interest in kid in nature. 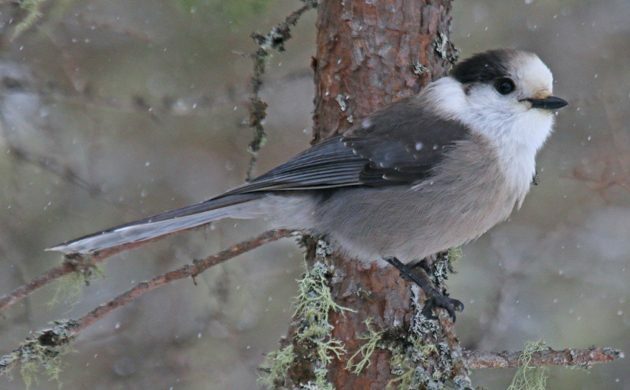 Gray Jays are ideal in this role but, in a pinch, chickadees will suffice. 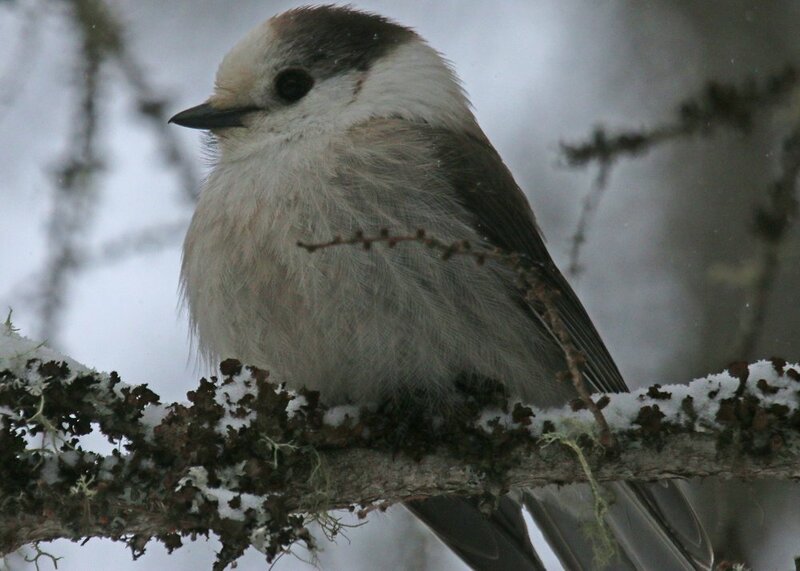 And, on our way out of the bog in the lightly falling snow, a Black-capped Chickadee came right up to us and, sure enough, flew to Desi’s hand when he held it out. 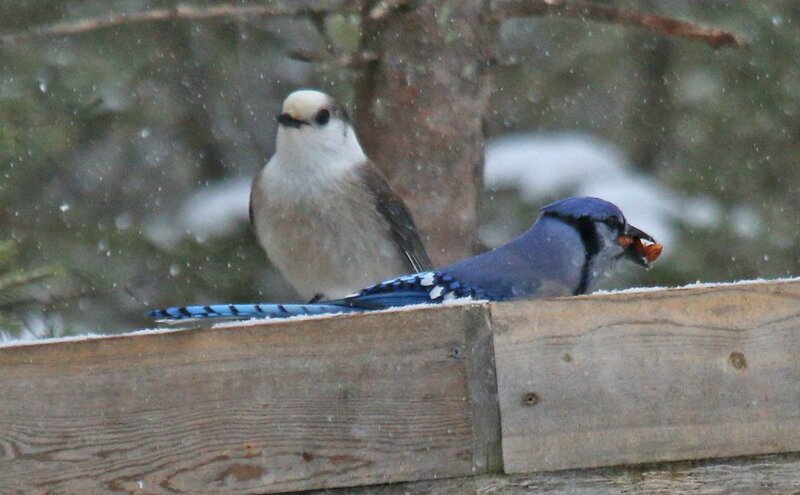 He liked it but he was much more impressed with the Gray Jays. Really cool post Cory, such a cool thing to do with the family.